A protestor at the Leveson Enquire accused Tony Blair of war crimes. He may well have a point. I was one of the million or so people who marched in protest against going to war in Iraq. But despite what I think about that one decision, I do not vilify Blair as much as some Labour supporters do. His priorities were in order. Education reform made a noticeable difference. Investment in health was also welcomed, even if the way the money was raised, has since been called into question. Blair was also electable, which is important. A Labour government will always be better for people from normal backgrounds than a Tory one. Even a Labour government, with what many on the Left of politics would see as far too neo-liberal, will offer more protection to the vulnerable than this ideologically driven Coalition. What is more interesting than either the protest, or the reaction to Blair being back in the spotlight, is what the former PM actually said. His strategy was never to take on the press. Cameron’s strategy was the same. In stark contrast, Ed Miliband and a few labour MPs, namely Tom Watson and Chris Bryant, started the rage against the Murdoch Machine. This is a massive shift. All parties have previously courted the media, now they line up to criticise the media. How people vote in a general election depends on a variety of factors; the media do play a role, and the most popular newspapers remain highly influential. Ed said at the Labour Party Conference ‘I am not Tony Blair’ and was applauded for it. He has shown by his actions in openly criticising News International that he is not like Tony Blair… but he must be at least a little like Blair in one vital aspect. By 2015 and in spite of any revenge that is taken by the Sun or other papers in the run up to the General Election, Ed must be a leader of the Labour Party who has enough popular support to eject an inept, shambolic Tory led Government from office, just as Tony did in 1997. Captain SKA is back with “SHAME ON YOU” aimed at all FAT CATS not prepared to pay their fair share. Captain SKA’s 4th release searches for the answer asked by millions of voters let down by the Liberal Democrats and Nick Clegg. Tory-Led Government Crimes Against British Policing. First posted on THE 67 MISSING PAGES! Tens of thousands of off duty Police Officers marched in protest at Government imposed cuts of 20%, causing the loss of 16,000 Officers. In addition, Government plans mass privatization of British policing. Tens of thousands of rank and file police officers marched in London on Thursday the 10th of May, in a protest at the vicious cuts and mass “privatisation” of the police service. The demonstration was the strongest show of defiance available to members of the Police Federation and comes as the call, from some officers, for full industrial rights grows. 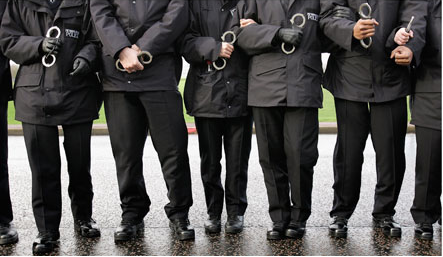 A fast increasing number of officers believe that if they are to lose the job protection they have always had as Crown servants, then they need real industrial muscle to defend their jobs and their working conditions. The sight of tens of thousands of cops taking to the streets is without doubt, a rare sight indeed, and the presence in their midst of a Chief Constable, Tony Melville, even more so. It is a measure of their anger, that police officers, many conservatives by nature, simply feel they have been pushed beyond the limits of patience. Whether their action will change anything is unclear. But with a £500 million shortfall in the 20% cuts required by forces still to be filled, the squeeze on the service in England and Wales is only getting tighter, making helping to keep our streets a safer place, ever more impossible. The damaging effect this is causing upon serving officers’ moral, is both damaging, and often immeasurable. The off duty marchers wore 16,000 black caps to show the number of officers the public will lose over the next four years and marched in silence past the memorial to fallen officers on The Mall. The last time police officers marched was 2008. This time the federation has been able to spread the word via the social networking site Twitter, spreading the word to thousands of concerned officers nationwide. Sadly, it would appear, that this Government is intent on privatizing our police service, in a fashion that would see the vast majority of police stations run by private security firms such as G4S, MITIE, along with others who intend to bid at the cheapest price. Intent upon giving private Security Officers, the powers to assist in recording crime, responding to ASB, and many other duties currently being undertaken by highly trained, Police Officers, & Police Community Support Officers. All this, I hasten to add, under the insulting guise of `reform`. `Reform` that is, in reality, a devastating cost cutting policy, that will leave our police service weakened, and far less equipped to do the very job it was originally intended to do, on its conception in 1838. I can certainly vouch for the fact that near 99% of all front-line police officers, are fiercely dedicated to the public and to the jobs they do, often with little regard to their own safety. However, the Government should heed the fact, that even workers as dedicated as this, have their tipping point!